File Types: OTF,AI,All Files; File Size: 669.94 KB; Vector: Yes. 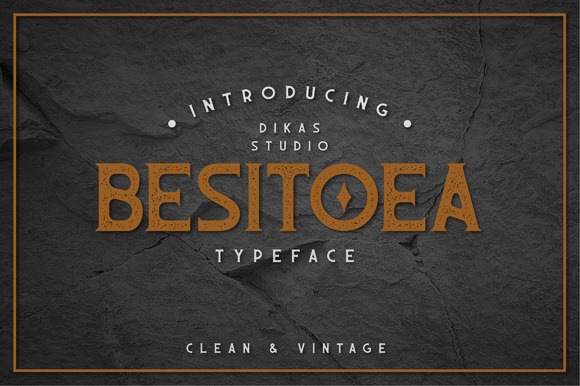 Besitoea basicly is a serif font with vintage modern look inspired from beer label. Besitoea its perfect to create vintage design, branding, logos, product packaging, invitation, qoutes, t-shirt, label poster etc. - Besitoea come with numerals, punctition, international language and standart character ( All Caps ) with 16 Alternates that give you vintage look. - 2 Style character, clean and vintage Whats Included ? - Bonus badge in Ai and Eps file Thank you for purchase this font :) If you have any questions don't hesitate to ask and leave a feedback/comment. Keywords: font, vintage, typeface, retro, grunge, stamp, beer, brewery, branding, label, logos, t-shirt, rough, moderen, handcrafted, badge, motorcycle, barbershop, handdrawn, press, handmade, classic, serif, vintage letter, vintage logo, retro font, old, rusty, barrel, hipster, bonus badge, packaging font, vintage design, vintage poster.